TriSpecific is a global coaching platform that's goal is to develop robust athletes, increase performances and not destroy health. We do this via simple, smart training and focusing on real food and body maintenance techniques. Thus developing the consistency needed to achieve and even exceed your goals. We also teach a love of the process because if you don't... You'll only go so far. I began my coaching career when I believed I could coach my then fiance now wife Charlotte Paul better than she was being coached at the time. I had done my tri coaching certification at first not to coach, but purely because I was intrigued and wanted to learn as much of this sport as possible. Leaving that course I had many unanswered questions of why some things were done the way they were. Ive learned from many sources, mentors, coaches, made a lot of mistakes, and through this experiential learning, I stumbled onto training methods I would have never been aware of. These mistakes and failures have helped me come up with training systems that allow me to accelerate performances and not destroy health. 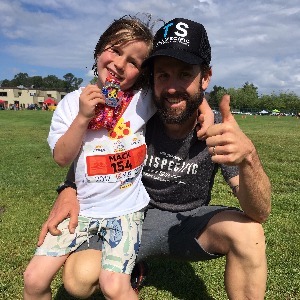 These training methods and everything else I learned helped me go from an 11:27 Ironman athlete to an 8:57 and then another sub9 performance adding Age Group Champion to my name. They also helped me coach Charlotte to overall professional Ironman wins and to age group world champions and everything in between. The purpose of TriSpecific is more than just triathlon, it's more than just a plan. Triathlon is just the vehicle we use to learn more about ourselves and create positive outcomes that are transferable to everything in life. More specifically our purpose at TS is to support endurance athletes like you, to breakthrough your boundaries and in doing so evolve as a human being. We work with athletes that commit to themselves and the coaching. We care deeply about feedback. Success. Coach Kristian Manietta has been notified of your message.